The Florence Police Department is offering a FREE unique opportunity for Florence residents to take an inside look at law enforcement and how the Florence Police Department operates. The Citizen Academy gives participants an extraordinary chance to learn hands-on about police operations, communications, crime scene investigations, use of canines and more! The service will be available on Monday through Thursday from 9:00 a.m. to 1:00 p.m. The cost is $6.00. At this time only cash or money orders will be accepted for any costs associated with fingerprinting. Residents can use this service when they are required by their employer to acquire a set of fingerprints, if they need a set of finger prints to obtain a passport, or for a variety of other reasons. If you would like more information about this service, contact the Town of Florence Police Department at (520) 868-7681. The Volunteer in Police Service Program is a National Organization supported by many law enforcement agencies throughout the United States. The purpose of the program is to assist the law enforcement agencies with non-criminal activities. 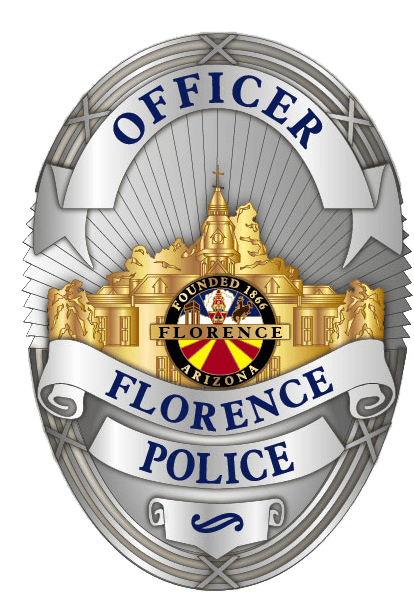 If your vehicle was impounded by an officer of the Florence Police Department please carefully read the information the officer gave the driver of the vehicle at the time of the impound for instructions. This page provides some additional information to frequently asked questions on this topic. We hope this information assists you throughout the process. Impound Hearings will take place on Tuesday and Thursday from 11:00 a.m. – 1:00 p.m. on a first come first serve basis. Monday – Thursday: 9:00- a.m. – 4:00 p.m.
Friday: 9:00 – 1:00 p.m.
At this time all requests must be submitted in writing. The proper request forms can be located in the lobby of the Police Department, faxed to you by contacting the Records Division or by using the downloadble form available on the bottom of this page. Please note that all reports take at least five (5) working days to be processed before they are available in records for release. Your report will be mailed or available for pick-up within three (3) working days from your request, providing the report has been processed and/or is available for release. Certain reports cannot be released without a court order. For cost of information not listed above, please contact the Records Divison. Payment Method: Cash or Money order. Do Not send cash through the mail.